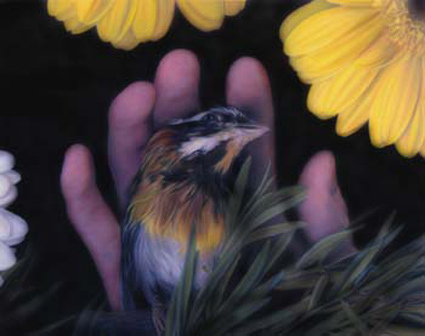 Bird on Hand, oil on panel, 5" x 6"
Tilly Woodward is a Visiting Assistant Professor at Central College in Pella and is the Director of the Pella Community Art Center. Tillyâ€™s career includes involvement in many community outreach projects throughout the state. Her work is in the collections of the Des Moines Art Center, Sheldon Memorial Art Gallery, Meredith Corporation, and the University of Iowa Museum of Art. Tilly Woodward creates small glimpses of lush flowers and grasses. Her oil on board paintings show human interaction with nature as a hand tangled in grass or holding a flower blossom. Tilly writes: "...I have pursued a series of highly detailed oil paintings that explore longing and loss, emotional landscapes that are often configured as intimate views of items from my garden, presented in hand. When I paint I think of the beauty of the garden, a small landscape, as well as mudras, gang signs, offerings, prayers and fairy tales."